Girls’ lacrosse, like the boy's, use netted sticks to carry, throw, and shoot a ball along a field in an effort to score goals. A goal counts as one point and is scored when the ball completely crosses the opposing goal line between the posts and under the crossbar. The team scoring the greater number of goals in the allotted time wins the game. Positions - One of the significant differences between girls' and boys' lacrosse is that more players take the field in a regulation game on a girls' team. Goalie: The primary role of this position is keeping balls out of the net. A goalie must be quick on her feet and willing to go after loose balls around the crease area. The more confident your goalie is, the more effective she'll be at turning away the different types of shots she'll face. Point: a defensive-oriented position this player works closely with the goalie, communicating what the opponent is doing and orchestrating where players need to be on the field to counter the attack.A point player must be a good communicator to help prevent defensive breakdowns from occurring. Because the point player doesn't stray far from the net, she's often in position to intercept passes to the middle of the field while defending an attack. Cover point: This player' covers the opposition's second home. Good footwork is an asset for excelling in this position because the player must stick with the opponent to deny passes and shots on goal. A cover point player is also relied on to make clearing passes, so she must be proficient at catching passes from the goalie and quickly turning upfield to look for teammates who can receive the ball. Third player: This player covers the opposing team's third home. Important attributes for doing well in this position are good reflexes, the ability to read the opponent's attack, and the ability to jump into the passing lanes to intercept balls. Left and right defensive wings: These positions require substantial running, as the players' primary responsibility is to guard the opponent's left and right attack wings. Center: This position is a magnet of activity on both offense and defense. Because the position requires strong play both with and without the ball, as well as a variety of other skills, the team's best player usually handles this position. The center patrols the middle of the field. When her team has control of the ball, she looks to step up into the action, where she can feed the ball to the first, second, and third home players. When her team is on defense, she retreats to her team's defensive half of the field, providing coverage against the opponent's center, disrupting the passing lanes, and looking to intercept balls delivered by the attack wings. Left and right attack wings: These positions cover a lot of territory as the players carry out supportive roles at the offensive end of the field — most notably, feeding the ball to the players manning the first, second, and third home positions. They also must hustle back on defense to help out the left and right defensive wings. Third home: A team's offensive prowess is enhanced whenever its third home player is an efficient passer. She can feed the ball to the first and second home players, as well as the right and left attack wings. She also takes shots on goal when scoring opportunities arise and creates openings for herself to shoot or pass. Second home: This position is similar to the point guard position in basketball, because the second home orchestrates the offense and makes the passes that help the offense run smoothly and effectively. In lacrosse, this player should be an excellent ball handler, because she'll likely have the ball on her stick more than most of the other players. The offense will be more difficult to defend if the second home player is a threat to score goals, too. First home: This position represents the most offensive play on the lacrosse field. The first home's main responsibilities are to score goals and to deliver accurate passes to teammates who are in scoring position. To excel in this position, a person must be quick and have sound ball-control skills. 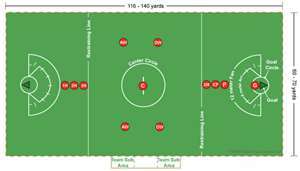 The maximum playing area is 140 x 70 yards and the minimum playing area is 110 x 60 yards. The goals are placed no more than 100 yards and no less than 90 yards apart. There must be a minimum of 10 yards and a maximum of 20 yards of space behind each goal line to the end line. Additional markings on the field include a restraining line located 30 yards from each goal line, which creates an area where only a maximum of seven offensive players and eight defensive players (including the goalkeeper) are allowed; a 12-meter fan, which officials use to position players after fouls; and an arc in front of each goal, considered the critical scoring area, where defenders must be at least within a stick's-length of their attacker.